Entire Prologue Episode of TRON: UPRISING! Here is the fantastic new TRON: UPRISING prologue series special -- "Beck's Beginning" -- in its entirety. This transcends being "just" a TV series -- this is feature quality -- and epic! TRON: UPRISING is smart, stunning, and PURE TRON! This incredible prologue special will also have a presentation on The Disney Channel on May 18th. Also click here for a look at character bios and vehicles seen in the series! RE: Entire Prologue Episode of TRON: UPRISING! Any chance you have a video for in Canada? trekking95 Wrote:Any chance you have a video for in Canada? Apparently, not currently -- however, this will be shown on the Disney Channel in just a few days as well -- on the 18th. It's definitely worth waiting just a few extra days if you can't see it now versus seeing it via a poor quality bootleg that may surface on the net -- this is a truly visually stunning special and excellent story -- and should only be watched with the best of viewing conditions to fully appreciate its incredible artistry and detail. I just saw it. All I have to say is wow man, that was epic sauce. Can't see it in England. Typical! Will have to be a little patient. I will confess to being a bit apprehensive about the series. I would like it remember Betrayal and Evolution, two stories that were set before Legacy but since we're already seeing different light cycles and Recognizers I'm not sure it will. I'm believe in complete continuity and I'm not sure the series will have that. Will have to wait and see I guess. tronprogram Wrote:Can't see it in England. Typical! Will have to be a little patient. Ridiculous! TRON: UPRISING is smart, stunning, and PURE TRON! Thanks for posting this, Jay! This is an incredible work of art! As you said, this is much more than just an "animated series"! The sophistication of the storyline, the thorough development of the characters, and the stunningly spectacular graphics make "TRON: Uprising - Beck's Beginning", a flawless introduction to this wonderful new element of the TRON franchise. I'm really looking forward to watching the rest of the series. And I hope, down the road, that Disney will release this series on Blu-ray disc. This is exciting! We're back on the Grid again, Programs! I truely WISH that Tron: Uprising Beck's Begining would have a an IMAX 3D release. I'd pay to see that. It's that good. This is a feature film quality production. It's the best animated production on cable I've seen since The Legend of Korra IMO. There were a lot of excellent tie-ins to Tron Legacy, and a few inside references to classic Tron. The holographic item and props and digital details even harken back to the PC game Tron 2.0 The 3.5 Gen Reco's and Light Cycles and other custom vehicles that make an appearance are magnifecent designs from Daniel Simon. 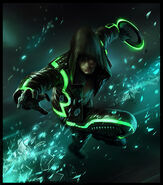 ShadowDragon1 Wrote:I truely WISH that Tron: Uprising Beck's Begining would have a an IMAX 3D release. I'd pay to see that. It's that good. This is a feature film quality production. It's the best animated production on cable I've seen since The Legend of Korra IMO. Excellent points Alan -- I said the very same thing this evening... TRON: UPRISING, which already looks phenomenal in 2-D, would be extraordinary to watch in 3-D. Actually, that's possible, though perhaps on a limited basis, as many 3-D TVs released now can do an excellent job converting 2-D material into quasi 3-D. I've watched the TRON: UPRISING Blu-Ray trailer (before TRON: LEGACY) this way -- and it literally looked as if the show had been created in 3-D. I watched it last night. Found it pretty enjoyable. "Everything you do or learn will be imprinted on this disc. If you lose your disc or fail to follow commands, you will be subject to immediate de-resolution. That will be all." I saw the prologue premiere and was impressed. In a way, I was right a few years ago that Rinzler was an undercover identity by TRON. That silver suit that Tron wore, was'nt that a digital disguise that he just gave to Beck in the end of the episode? It's interesting that we see the extent of his physical damage from CLU, but did'nt that take place after Flynn ran off from Clu's arrest scene from Legacy? But what I don't get is how can CLU leave Tron there on the ground after damaging him when he could've taken him in to be rectified, unless Tron resisted the rectification process? It was a bit hard to hear the dialogue a bit and wished it was closed captioned. I hope the iTunes download has captions built in. Otherwise, beautiful animation! About time we got a TRON series! Unless the third film comes out with CLU b--tchslapping the new MCP or something. Pilgrim1099 Wrote:I saw the prologue premiere and was impressed. In a way, I was right a few years ago that Rinzler was an undercover identity by TRON. 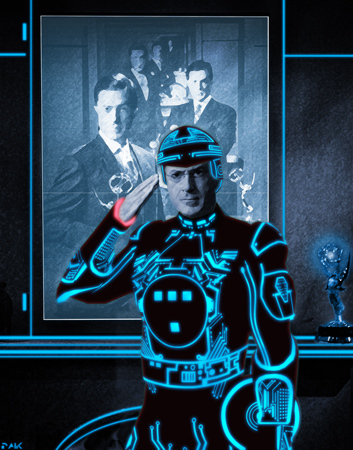 That silver suit that Tron wore, was'nt that a digital disguise that he just gave to Beck in the end of the episode? EDIT: by the way I caught a mistake where Flynn gets zapped. He's working in front of a large monitor but in the film we see the Dillinger desk instead. Did the LOST boys screw up again? As writers, they probably don't have any input on the visual style of things. My guess is that the usage of a huge monitor was for a dramatic effect. In the end, though, it's really not that big of a deal. There's like an army of 50 or 100 Black Guards near the beginning, while it was stated somewhere (I think in PC/360/PS3 Evolution) that there are only ever 34 of them around at a time. The fact that Beck seems to be picking them off one by one like they're nothing (like the one in the helicopter) doesn't really seem to be canonically consistent with the fact that they're supposed to be the best of the elite. Just a little bit of nitpicking. Love the pilot episode, overall, though. Kind of hoping they'll release a soundtrack or something, as well. I'm really liking the character development, especially that of Paige and the relationship that is beginning to develop between her and Beck. I don't know if this is just a coincidence or if it was actually intended, but I find it curious that they named her "Paige". That was actually the name of Quorra's character in the early development of TRON: Legacy. You can actually see it on some of the early concept art when they were developing her look. Man a soundtrack would be awesome, I loved the music in the premiere.